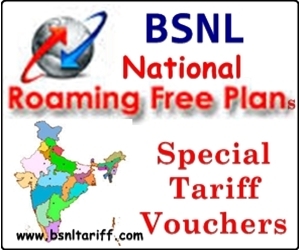 Most-Trusted Telecom Brand in India Bharat Sanchar Nigam Limited (BSNL) introduced new ‘Roaming Tariff Plan’ and ‘Roaming Tariff Plan-FR’ under GSM Prepaid Mobile Services. MRP of the above Special Tariff Vouchers (STVs) may varies in each Telecom Circle in the price band upto Rs.3(+ / -) of above price considering Local market condition and technical feasibility. The MRP of plan vouchers for Jammu and Kashmir will be exclusive of Service Tax. The above Tariff will be implemented with effect from 15-07-2013.